A tourist elects to take scenic flight over the Alaskan wilderness while on vacation. Or maybe they are visiting the Grand Canyon and would prefer an aerial view. While visiting friends in Florida, another couple detours for a quick seaplane romantic sunset adventure. Aerial tour operators provide locals and tourists with a unique view of the land all while introducing them to an exciting mode of transportation. 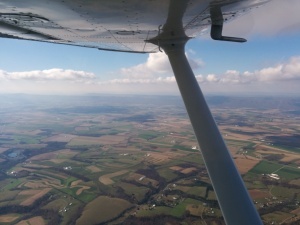 Aerial tours are nonstop flights flown within a 25 mile radius of the departing airport. Each commercial aerial tour provider is required to apply for and obtain a letter of authorization. Popular aircraft for scenic flight tours can range from small four place aircraft to large helicopters. Some companies even provide an extra twist to the flight with biplanes, glider rides and warbird flights. -Florida tour operator, Jones Brothers & Co. Seaplane Adventures, flies vacationers in several Cessnas on floats as well as a Twin Seabee. -Head north to Burlington, VT to enjoy aerial sightseeing rides over Lake Champlain with Vermont Flight Academy in their Piper PA12 floatplane! -From fall foliage flights to Christmas light flights, two to three people can hop aboard a Duffy’s Aircraft Cessna 172 for a flight over Marshfield, WI. -Explore the mountainous views of Northwest Montana with Kootenai Aviation. They also provide air taxi, real estate and aerial survey services. The aircraft insurance experts at Aviation Insurance Resources (AIR) became pilots because they fell in love with the view from above. AIR agents shop all the major aviation insurance markets to ensure their customers receive the best rate, so they can keep their business soaring high. To get started on your sightseeing insurance quote, please call 877-247-7767 or complete a quick quote request form online! You can also follow AIR on Facebook, Twitter, LinkedIn, and Google+.